Chail is one of the best tourist paradises in India that includes most of the interesting places to visit. Tourism in Chail includes a visit to the Maharaja Bhupinder Singh's Chail Palace, World's highest Cricket ground at an altitude of 2,250m, Siddh Baba Ka Mandir, Wild Sanctuary and the nearby picnic spots that has the capacity to attract anyone towards it. Siddh Baba Ka Mandir is the place that has grabbed the attention not only for the reason of its religious penance but also for its historical importance. Siddh Baba ka Mandir was built in the year 1891 by Maharaja of Patiala Bhupinder Singh in Chail where he was about to build his Palace as his summer capital when he was exiled from Shimla by Lord Kitchener (The British Empire). The historical story behind building the temple says that the Maharaja selected this place to build his palace previously as his Summer Capital and the construction for the same got started in full swing when Siddh Baba appeared in Maharaja's dream and asked him to stop the construction of Palace. Siddh Baba said that he used to meditate on this place and it should not be used to reside or for any personal purpose. And after which Maharaja stopped the construction of his Palace and ordered to start the construction of temple of Siddh Baba, which is quite famous and tourist's attractive place at this time. 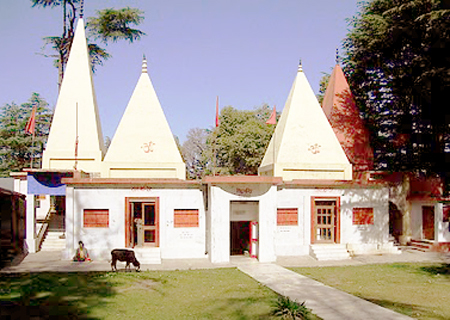 Siddh Baba Ka Mandir is being considered as a place of holy soul who has occupied that space in Chail; hence every tourist visits this place, bow their head here to seek the blessings of Siddh Baba. This temple not only makes it a religious place but also a place of tourist attraction. Among the local people of Chail, Siddh Baba ka Mandir has very importance, and even tourist from the different corners of this world respect this holy deity and his devotees. Siddh Baba Ka Mandir speaks about the importance of religion and care that Maharaja Bhupinder Singh had, who made his act immortal in the history of Chail, Himachal Pradesh. Maharaja still seems alive in the heart of local people of Chail not just because of this holy shrine but also because he made this small beautiful hill station as famous as that it has been recognized in the whole world. Visit Siddh Baba Ka Mandir whenever you visit Chail, and seek his blessings.